So, on the same shopping trip during which I found the aforementioned original version of Billy's self-titled full-length debut, I also found, at a completely different record store mind you, this. 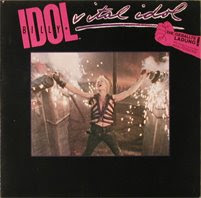 It's the German version of the original 1985 release of Vital Idol. On the front (in that little red fist there) it says "DIE GEBALLTE LADUNG! Alle songs in extended MAXI-VERSIONS." And boy, are they. Vital Idol is 90% of the reason I love Billy Idol. It is an album I got hooked on in the fifth grade, and I've never not owned a copy of it since then. If extended mixes of Billy Idol songs sound terrible to you, I understand your hesitation. But here's the thing: these aren't your traditional remixes. "White Wedding" is simply extended to contain both parts 1 and 2. "Dancing With Myself" is given an "Uptown Mix," but I think they may have just added an additional guitar track. If that. Same with the "Downtown Mix" of "Mony Mony." I can't really tell the difference from the original. And while those songs are fine in their barely altered versions, it's the more random remixes here that really benefit. "Flesh for Fantasy" is chopped up a little bit, and it actually improves on the original. Same with "Catch My Fall," "Love Calling," and "Hot in the City." All better than their album versions. This LP, sadly, does not contain the "Mothers of Mercy" mix of "To Be a Lover," which is included on the more common 1987 version. And it's a damn shame, because that song is as good as any of the other ones on here. But still, I'd rather have this weird version with the red German fist. Seriously, if you think you don't like Billy Idol, buy this. You can find it for a few bucks anywhere. "Catch My Fall (Remix Fix)" will change your life. Well, maybe not. But it's an incredible track. "White Wedding Parts 1&2 (Shotgun Mix)"
Man, this album always reminds me of being really young, Run-DMC-style. The "Mony Mony" live version is superior to the studio.